I have hacked myself an unofficial Harmony BIOS version. Try this. That sounds like your joystick is not a standard one. Can you confirm? Its a standard atari joystick. I've tried several. Has either version of the Boulder Dash demo ever been compatible with the original Harmony? I reflashed mine with 1.06 today, and everything up to and including the title screen works fine, but as soon as I try to start a game after choosing level and difficulty, I just get a blank screen with VBLANK turned on. Nope. I works with a Krokodile Cart and probably with an Encore too. If your TV supports PAL60, then you can use the NTSC bios. The harmony menu will display in PAL60 but with wrong colors (blue text instead of green). The format of the bios does not affect the games, just the menu. Edited by alex_79, Mon Sep 10, 2018 3:17 PM. Harmony cart locked up playing with family on Thanksgiving after player collision, latest firmware and bios fixed it - much better looking font and easier to read menu! Click Assets to show the download links. This is the Personal Computer software program that communicates with the Harmony Cart or Harmony Encore Cart connected with a 4-wire USB Data cable (most are 2-wire Charging cables). HarmonyCart_1.3 is used to upload the hbios Firmware, among other uses such as “flash Harmony to Single Cart use” good for developer testing of loading “your 1 game” into Harmony to check that everything works. This is fixed and updated by StephenA — same member who maintains Stella (an Atari 2600 emulator). As of this post, December 2018, it is HarmonyCart_1.3. Thank you StephenA for doing this! *The latest (best) versions of software with bug fixes, added features, etc., are not all in one place for many reasons. The main reason being that the AtariAge community creates “Unofficial” versions, shares them somewhere, and having no formal way to have them incorporated into “Official” versions, they end up in different places. Edited by iesposta, Sun Dec 9, 2018 1:16 AM. As of this post, December 2018, it is Version 1.03. So the latest version for the Harmony Encore is still version 1.3 which came out a little over 5 years ago. The latest Firmware is: hbios_NTSC_106.bin on Page #1 of this pinned thread of messages. HarmonyCart software lets your computer upload the hbios Firmware to the Harmony Cart. HarmonyCart software came out “a little over five years ago”, but the Source Code has had 22 changes since then, last change being July 2017. Those 22 changes will become HarmonyCart 1.04 software when the next release comes out. I've been trying for years (unsuccessfully, obviously) to get the links on AtariAge to point to Github, and have it be the official development location for HarmonyCart software. Including adding a webpage indicating that fact. I've contacted the developer of the hardware multiple times, without response. At this point, I've mostly given up on that project, since I get zero feedback from either users or (most importantly) the hardware developer. So it's no surprise that the development is haphazard, done all over the place, and nobody knows what the latest version(s) are. On a side note, this doesn't happen for Stella since to put it bluntly: (a) I have mostly full control over the project and its location, so (b) I really don't have to get anyone's permission to do something. That project is a well-oiled machine compared to the HarmonyCart one. I have been using the latest BIOS version 1.06 and Harmony Programming Tool version 1.3 for a few years. However it sounds like people are making unofficial changes to the software and then not changing the version number. It is common practice for programmers to always change the version number of a software program hat has been updated. I guess one needs to go through some type of official channels to get the version number changed when there is improvements in the Harmony Encore software. The last I heard is the Harmony Encore SD cartridge is the best version on the market for North American consumers. 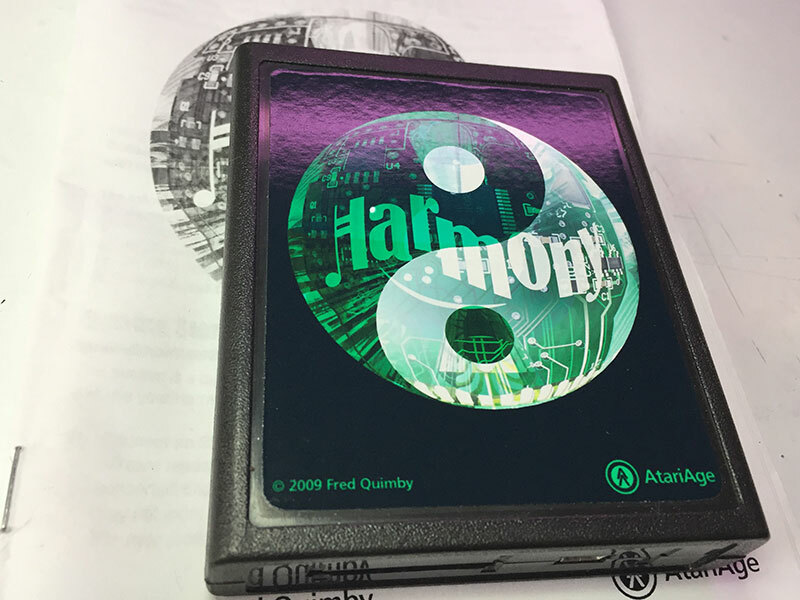 Is there any other USB or SD ATARI 2600 cartridges that are currently on the market besides the Harmony product line? According to this Flashcart and Multicart link the Harmony Encore and standard Harmony are the only SD cartridges that are currently available for the Atari 2600. That is my understanding as well. It was the successor to the older, legendary "cuttle card" long unavailable. I have one for sale that I've never used if anyone is interested. I'd prefer to sell it direct to an Atari Age member and avoid the 10% ebay markup + 3% paypal markup. However your price of $67 shipped s still $6.25 cheaper when compared to the new $73.25 shipped price. I am guessing that you are selling the Harmony Encore SD model with the cartridge shell in place. Yea those EBAY fees can be between 10-16% and the PayPal fees can be over 4.25% (depending on what plan one is on). Edited by HDTV1080P, Mon Dec 10, 2018 4:31 AM. Thanks for the detailed history. It takes a bit of hunting to find all that info. Mine looks like this [attached.] No mention of the word "Encore" anywhere on it so I'm assuming this is just the standard "Harmony" cartridge. Although I'm not sure why I would've chosen that one if the upgraded version was also available. As far as I can tell, there's no real difference except the Encore version can play roms >32k in size. Either I didn't know the Encore version existed, or I figured the cheaper one would suffice; I couldn't name a 2600 game >32k off the top of my head. My memory is that I paid around $65 for it. Although my memory is highly suspect on anything that happened more than a month ago. Anyway, thanks again for all the info. A while back, Albert and I discussed the software and could provide feedback. I can't seem to find that discussion but I will keep looking. Would be cool to make a Channel F SD-cartridge out of the Harmony project. Sure beats the $129.99 you're hawking them for on eBay though! On the official Harmony Encore website, if one wants all the accessories like SD card, USB cable, etc. The Harmony Encore SD cartridge costs $95.25 delivered. Before the $16 price drop last year, on the official Harmony Encore website it would have cost $111.25 delivered instead of $95.25. Amazon and EBAY dealers after credit card fees and other fees are paying around 20% in fees which justifies the higher price. But yes its cheaper to purchase the Harmony Encore products directly from the Harmony website. Edited by HDTV1080P, Wed Jan 30, 2019 1:55 PM. b) Is it possible to revert the cart back to non-development mode (so I can enjoy the games on my SD card again)? How do I do that?